The son of olim from New York is the soldier who provided the IDF with the findings that enabled to determine the death of Lt. Hadar Goldin. The findings that enabled the IDF’s Chief Rabbinate to declare the death of Lt. Hadar Goldin were provided by an IDF commander who fearlessly and selflessly pursued the terrorists who abducted Goldin's body. First Lieutenant Eitan, the son of olim (immigrants) from New York, realized following Friday morning’s incident that the Hamas terrorists who attacked Goldin and two other soldiers had taken off with Goldin’s body. 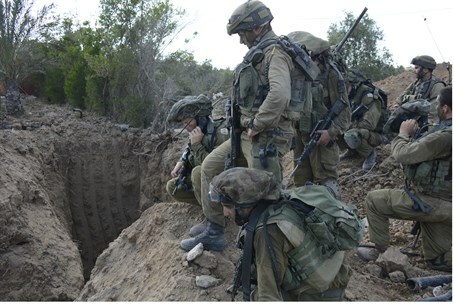 Eitan then proceeded to pursue the terrorists through one of Hamas’s terror tunnels, doing so despite the fact that it was against orders and despite the huge risk involved in running through a tunnel that could be booby-trapped. Eitan pursued the terrorists for several hundred meters and exited the tunnel when he was unable to track them down. He did, however, locate findings which later enabled IDF rabbis to determine that Goldin had died in the attack. A senior officer of the IDF General Staff said that Lieutenant Eitan is the definition of a hero who operated bravely while risking his life to try to save his friend. According to the official, who was quoted by the Yedioth Ahronoth newspaper, even though Eitan acted contrary to instructions, he will be recommended for a citation. Lieutenant Eitan, 24, lives in Jerusalem, and before joining the IDF studied at the Horev Yeshiva High School and then at the Eli pre-military academy. He joined the Givati Brigade and served as a deputy commander under Major Benaya Sarel, who was killed in the same attack as Goldin and a third soldier, First Sgt. Liel Gidoni. Eitan is the youngest son of Simcha and Susan, who came to Israel from New York in 1985.